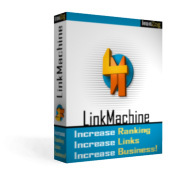 LinkMachine is all you need to benefit from establishing quality reciprocal link exchanges and to climb the search engine ranks, without spending valuable time doing the grunt work yourself. The Premium SEO upgrade package includes all of the features of the Premium and SEO upgrades, as well as all of LinkMachine's free Basic features. These are each listed below. Exchange links with other sites that use LinkMachine, without the need to send e-mails. Search by keywords to quickly find many potential link exchange partners. Full automation sends out all of your link exchange invitations with one click, mails reminders to sites that haven't responded, keeps track of reciprocal links automatically and takes action when a link is found missing. Find the sites that link to your competitors' sites (or any other sites) and invite them to exchange links. Reciprocal link checker can spider a site to find a link that's been moved to a different page. Import your current link pages, from the web, from HTML files, or from .CSV files. Automatically search for a contact e-mail address on sites you'd like to contact. A powerful search engine built in to your link directory helps your visitors find what they're looking for. Generates link pages free of the "Powered by LinkMachine" tag. Built in Site Manager tool makes it easy to manage LinkMachine installations on multiple web sites. Include a CAPTCHA graphic on your link submission form to prevent automated submission of spam links by computer 'bots'. Plus, all of the standard LinkMachine features listed below! Uncover the secrets used by your successful competitors, and learn how to outdo them. SEO Wizard analyzes thousands of pages to produce a simple step-by-step guide to rocketing your site to the top of the search engines. SEO Wizard makes it easy to e-mail the webmasters of the top sites that link to your successful competitors, inviting them to exchange links with your site. Graph the progress of your site's search engine rankings, the number of incoming links, Alexa rank, and more, with RankTracker. Link Analyzer gives you all the information you need about the incoming links pointing to your site (or any other site), including anchor text, PageRank, and more. An indispensible search engine optimization tool. Easy to install, no download required. Organize your link pages into categories and subcategories of your choice. Choose from a variety of link page layout styles, or create your own custom style. Seemlessly integrate your link pages with the rest of your site using page templates. Link pages are generated as search engine friendly static HTML, and exist on your own web server. Webmasters can submit their site or modify their site's information. You simply approve the sites. Your link pages are updated automatically, no need to upload revisions. Enter a new link's URL, and LinkMachine will fetch the site's title, decription, and e-mail address. You can hilight special sites using any icon graphic of your choice. Many icons are provided. Easily check all the sites you link to, mark those that no longer link to your site, and send them notification e-mails. You won't get cheated by reciprocal links that include the rel=NoFollow tag. LinkMachine ignores these links. Supports one-way links as well as reciprocal links. Dynamic site list makes it easy to find the sites you need. Includes text search function. Context sensitive helper guides you through the process of setting up link exchanges. Each category's link page can use a separate page template, allowing you to show content customized for each category of links. Option to display a separate list of your most recently added links. The links on your link pages can be set to open in the same window or in a new window. E-mail notifications sent to you whenever a site is submitted or a link exchange invitation is accepted. Option to send out e-mails as HTML or plain text. Export your link data as a .csv spreadsheet file, as a backup or to generate reports. Five fully customizable e-mail templates. Works on any web server that supports Php 4.0 or above.